Two weeks from tomorrow, I’m moving to Washington, D.C. I signed my lease (I’ll be in the Petworth neighborhood of northwest D.C.), I’m reading POLITICO Pro’s articles and briefs as “homework” and I’m wading through my benefits paperwork. I’m doing homework of another kind, too. Namely, the homework of getting acquainted with the city in which I’ll be living. Even though I’ve been to D.C. twice in the past month, I want to make sure I know what I’m getting into when I move. I’ve done the D.C. tourist thing, so travel guides won’t really help. For this mission, I turned to Twitter. In the past couple of weeks, I’ve added food trucks, restaurants, clubs, media, sports teams and figures to my TweetDeck, with a column reserved just for D.C. stuff. I think it’s working well — I’m getting familiar with the lay of the land and what it offers, even though I’m not even there yet. I’m hoping that once the move is permanent, I can use what I’ve learned about the city so far to make the most of it right from the start. I recommend this strategy to anyone moving to a new city. Find people and places that interest you, and follow them. See if Foursquare offers a city badge for your area and what venues are listed. Map everything and get a good visual understanding of your area. Download mass transit apps. Check schedules for the local sports teams. Message people already in the city and ask their advice about what’s good. In other words, be proactive. You can get into a city before you actually get into a city. 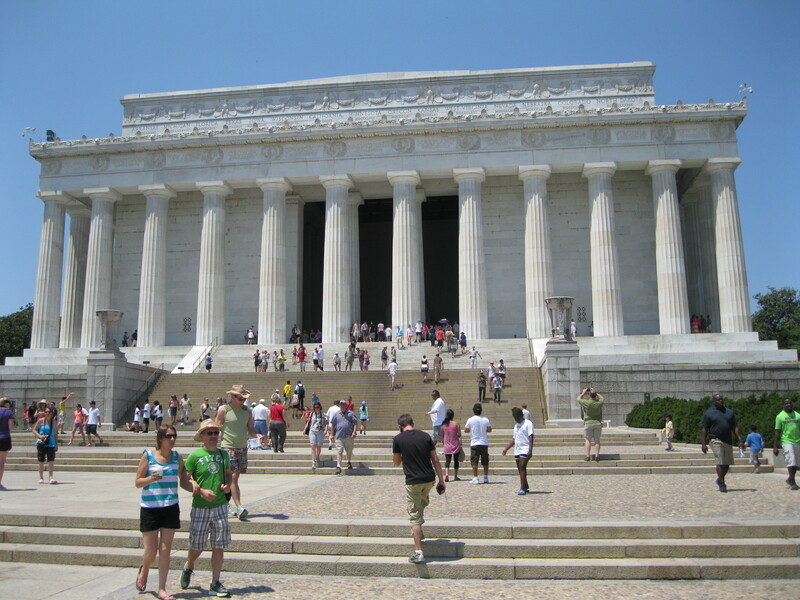 In the meantime, enjoy this photo of the Lincoln Memorial, one of my last “tourist” shots of the city. Tagged beltway, food trucks, foursquare, moving, politico, social media, tourism, transit, traveling, twitter, washington d.c.
Fertilizer-pushing is not my strong suit. I’m deep, deep into the job hunt at the moment. When I apply for a position, I do my very best to use direct, plain language. If I describe an achievement or a milestone, I use tangible markers. Kansan.com saw increased site traffic and expanded multimedia content, and won a Pacemaker from the Associated Collegiate Press when I was the site’s managing editor. See how simple that was? Almost a year ago, I wrote about social media strategy with the same level of annoyance, and nothing has really changed. How can we, as journalists, put such a high value on clear, concise language, while simultaneously clogging our CVs, “About” sections and job postings with rhetorical nonsense? If I read a job posting and can’t even figure out what my daily duties would be, I move on. In my earlier post, I hypothesized that maybe we use vague language to describe social media because even we haven’t really figured it out yet. Or we want to seem indispensable. I grimace when I see anyone describe themselves as a “social media guru.” There is nothing spiritual about Twitter, I promise. If you’re that good, you don’t need to hide behind flowery language. Ascribing some higher level of importance or even mysticism to social media ignores or downplays the stone-cold truth: If you link to quality content and reply to your audience respectfully and helpfully, you will gain and maintain followers. If you ignore queries or rarely tweet or spam people, you won’t. From the perspective of a company like Foursquare, successful branded accounts will post tips early and often and reward their followers with badges and possible merchandise discounts. Foursquare is, at its root, a game. So give your customers that experience. I love editing. I love the ins and outs of journalism on the Web, and I love social media and what it can accomplish in terms of connecting people and spreading information. I love those things so much that I can call a spade a spade. I can say exactly what I do. I hope others can do the same. Last fall, I started using my Foursquare account more. I was very jealous of my friends’ badges, including a Cupcake Connoisseur badge from TLC. I wanted it (it was cute!). I found a couple of London bakeries on the TLC page and visited one the next time I went into London. That bakery was The Hummingbird, and I’ve been back multiple times since and I kind of want them to make my wedding cake if anyone’s crazy enough to ever actually marry me. I never got the cupcake badge (it retired and I had eventually had to settle for Bravo’s Just Desserts badge), but the moral is simple: I sought out an entirely new business and became a repeat customer based on a circular graphic. Foursquare badges are a lot of fun and I’d argue that they’re more satisfying to collect than mayorships (although I wouldn’t turn down 20% off at Starbucks). I have 39, and each one is a happy reminder — an ode to my coffee addiction, another trip to the cinema, a late night at the library, a day in London, airports on different sides of the world. They can mark an event — were you at the Colbert and Stewart rallies? Or access — so you got into five different SXSW parties? Or sheer dogged determination — 20 different pizza shops, really? And, I’d wager, no one has the same exact set as anyone else, apart from newcomers. In the wake of Google+, Google announced a couple of days ago that you could start earning badges based on stories you’d read on Google News. I mentioned on Twitter that I loved badges and thought the idea was neat, and a New York Times interactive editor tweeted back to ask why. I thought about it and replied back that it’s in our nature to hoard and collect. Foursquare badges (and soon-to-be Google News badges, I hope) are like digital postcards or keychains. They’re reminders of where we’ve been and what matters to us. You can tell a lot about someone from their badges: where they live, where they eat and shop, what brands they follow. As a committed anglophile eager for others to see the London that I see, I once wrote about how London could use Foursquare, and I stick by that still. It can be easy to get consumed by social media, but Foursquare is brilliant in its mobility. It’s a social media app that necessitates breaking away from your computer cord and going out. Likewise, Google News badges reward you for expanding your knowledge and learning and reading about different things. Are badges somewhat silly? Of course. Only a few Foursquare badges are ever linked to any tangible monetary reward. At the end of the day they’re just cute graphics on a profile. Will I keep having a blast earning them, and smile whenever I unlock a new one? Oh absolutely. Google+ — a plus, or a minus? It’s been about 32 hours since I accepted my Google+ invite, and I’m ready to give my initial reaction. My signed-up friends — most of whom are former journalism school classmates — and I have used Google+ to debate the merits of Google+. How meta. One of my friends called it “Facebook built by the post-Facebook generation.” Others praised its cleanness and ease of use. While I maintain a pretty far-flung social media presence, it’s rare that I join a platform this early on (although my Facebook account, from June 2005, is relatively ancient). So I thought I’d take advantage of that and offer up my impressions. Here it goes. The design is remarkably clean and straightforward. It doesn’t have a signature “look” like Facebook just yet (although it dovetails well with Gmail, Reader, Docs and other Google goodies), but nor is it an eyesore like MySpace tended to be. I love, love, LOVE the idea of circles. My friends’ opinions vary somewhat — some praise it, others think it builds walls needlessly. My one hangup with Twitter is that it’s hard to separate personal, non-DM replies to friends from more professional/serious tweets. With circles, you can easily keep professional items professional and personal items personal. You can do this with Facebook, too, but in my experience it’s a much bigger headache. It seems to take the best parts of Facebook, Twitter, LinkedIn and Tumblr and combine them. You’re free to shape your profile however you want — one of my friends is off and running with GIFs, others are sharing videos and photos and others are having conversations through status updates. It has a definite “it is what you make it” feel. The simple yet aesthetically nifty way that Google+ displays photo albums is something I like, but I haven’t seen much said about it. Instead of cycling through individual photos in an album or seeing a wall of uniform thumbnails (like Facebook), photos are displayed with their cutlines in a crisp mosaic. Thumbs up. I like the idea of Sparks, where you submit subject tags of interest (politics, economics, news, whatever) and receive a filtered newsfeed as a result. It’s nothing that Google Reader and a Twitter feed don’t already do, pretty much, but it’s nice having an in-platform option. I’d like to see photo- and video-specific postings that allow URLs and not just file uploading. You can share online photos and YouTube videos, obviously, but as far as I can tell it’s treated like a generic post. Given Google’s ownership of YouTube, this is kind of awkward. EDIT: Google+ actually does allow for photo- and video-sharing using URLs. For some reason I was unable to locate it earlier, but it’s definitely there. Consider this shortcoming deleted. The hangout feature, which is basically a sprawling video/chat meet-up (either planned or impromptu) has potential, but I confess I haven’t tried it yet. It looks like some outlets, like The Huffington Post, have used it already with some success. Unlike Twitter (which allows one “official” URL) and Facebook (which buries them), Google+ lets you link to multiple personal and social media profiles, and displays them prominently on your page. I have links to this blog, my LinkedIn profile, my Tumblr, my Twitter and my Foursquare. Nifty. The biggest complaint: so few people. With about 4.5 million users (last time I checked), Google+ has less than 1% of the registered users that Facebook does. It seems content to follow a pace of steady, gradually increasing growth. I think its real test will come when “normal” people — not journalists or technology enthusiasts — start migrating over, if they do. Google+ has to offer them something that they’re not getting with Facebook or Twitter. What that might be, I think, depends on the user. But Google+ can’t rely too much on exclusivity and being a journalistic utopia, or else it could easily go the way of Google Wave. So there you have it. Frankly I’m pretty impressed, but only time will tell if the novelty can successfully segue into indispensability. There comes a time in (nearly) every journalist’s career when she (or he) has to take a break from the profession, for whatever reason. I’m in that position now, with graduate school. I admit that at times, without a paper or news site for which to edit, design or write, I have something of an existential breakdown. Am I still a journalist?! Is someone in a trench coat going to revoke my membership card? That kind of a break, whether it lasts months or years, or is permanent or temporary, can be difficult to take. Here are some ways for the journalist in limbo to stay sharp (or more accurately, they’re how this journalist in limbo stays sharp). 1. Keep writing. I write all the time — blog entries, academic essays, dissertation notes, tweets, neurotic emails to my mother. It doesn’t have to be publishable or even journalistic. Stay used to writing as much as you can. It keeps your voice, grammar and mechanics sharp. If you’re in school, academic research is good practice for looking up public records. I’m looking up Hungarian electoral data; what are Sarah Palin’s emails compared with that? 2. Keep reading. I read and skim a ton of content every day. The New York Times, Washington Post, Mother Jones, Huffington Post, Guardian, BBC, Poynter, Telegraph, Gawker, Mashable, Slate, Salon and Kansas City Star form my core go-to links, but there are probably dozens more that I visit tangentially. Not only do I stay connected with global, national and local news, but I also get a good dose of quality writing and reporting. Good writing comes from good reading. 3. Keep practicing skills. This could be any one thing, or several small things. For instance, I’m working through HTML and CSS exercises in a workbook, and sampling some free online courses through News University. The code work is a refresher of basic skills I learned in J school, and the online tutorials offer a more theoretical approach to ethics, business planning and management. News University also offers inexpensive online help with several critical applications like InDesign and Photoshop, if you’re interested in that. 4. Stay engaged with social media. I tweet all the time, on a variety of topics — politics, sports, cooking, travel, movies — and it helps me practice brevity in my writing (see #1), engage others in dialogue, learn about different sources of news and practice filtering information. I’m also active in Foursquare (I love leaving tips) and maintain a LinkedIn account. You don’t need a steady journalism job to build an audience. 5. Network, as an extension of #4. Talk to people and follow people in a wide range of professions, not just journalism. Think of everyone as a potential source. Follow accounts that regularly link to job postings, maintain a website for your professional use and keep all of your contact information up to date. I created and ordered my own business cards, which I designed myself from scratch. Use the time when you’re not beholden to a media company to cultivate your own brand and learn how to sell yourself. I’d be jumping the gun if I told you that the above points were guaranteed recipes for success (I’m still in graduate school and don’t have a job yet), but they’ve definitely helped me to stay in the loop and feel connected to my chosen profession. I’ve worked for a newspaper of some kind in a staff capacity almost non-stop since I was 15: four years on my high school paper, four years on the University Daily Kansan and consecutive summers at the Indianapolis Star, Columbus Dispatch and Kansas City Star. It’s taken me a while to accept that while it’s awesome to get paid to write and edit and have an official press pass, my writing and opinions aren’t necessarily less valid if I’m not employed at a newspaper. Do I eventually want a full-time job in journalism? Yes, I think I do. But that doesn’t mean I have to sit and twiddle my thumbs until I get one, and neither do you. About a month ago, I wrote about how London could (and should) use Foursquare. I maintain that any or all of those suggestions would still be great. Today, Pew released a study saying that only about 4 percent of online users use location-based applications like Foursquare and Gowalla. Tomorrow, I’m taking a mental-health adventure into London. At least two places I’m planning to visit — Hummingbird Bakery and Tsunami — I would not have known about had it not been for Foursquare. And that, I think sums up what Foursquare’s mission should be: helping people discover new places in their cities and giving them incentives to b adventurous. 1. Move beyond New York, Los Angeles, Chicago, San Francisco and Austin. Foursquare began in New York and obviously that’s where much of its infrastructure is, but if new users who aren’t from a major city see that few venues they frequent are listed or that all of the venues needed for a certain badge are located far away, they won’t want to join. It makes sense for brands like the Wall Street Journal or events like the Rally to Restore Sanity to have city-specific venues, but why should the Trainspotting badge be limited to San Francisco, or the Far Far Away badge be limited to above 59th St.? I ride trains all the time and I’m pretty far far away from home right now. Other badges that used to be city- or event-specific have since been opened to the general public; do that more. 2. Be more aggressive about weeding out duplicate venues. Cheating mayors’ days may be numbered, but that Starbucks on the corner is still listed as five different places, with five different mayors each getting 20 percent off their peppermint mochas (mmm … peppermint mochas). I also fail to see how each platform at King’s Cross needs its own venue listing. 3. Step up brand recruitment. There’s evidence that this is in the works, which is good. It’s not just about recruiting more companies or offering more deals. A lot of the issue is simple publicity — you can’t make use of deals that you don’t know about. I’d like to see a database or listing of businesses with specific Foursquare deals. Plenty of third-party sites offer this sort of thing, but there really should be an official listing. A decal in the window will only go so far. I’d also suggest inking more deals with tourism bureaus and universities. 5. Expand the number of badges more often. I have 17 right now. Excluding badges that I won’t be able to get because of a one-time event or because I’m not in that city (see point #1) and any “surprise” holiday badges like the Halloween badge from last week, I have the potential to earn maybe 8-10 more in the next few months. Keep them coming and keep them fresh. Badges are a powerful psychological reward (trust me, I know), but keep them novel. There you have it. I suspect that the vast majority of Foursquare’s problem — if indeed it has one — is lack of inclusiveness. It’s a fine line between being open to enough people and being too open. A lot of the perks are attractive precisely because so few people have them. But that’s a balance Foursquare must strike if it hopes to get beyond that 4 percent. Now that I’m able to successfully take my mobile crack, er, media addiction on the road (thanks to an iPod Touch and, I hope, an Android phone in the near future), I’ve become a major fan of Foursquare. What is Foursquare? Sometimes it’s hard for me to remember that not all of my friends are journalism/social media junkies, and most people probably aren’t familiar with it. Think of it like Twitter on the move. Basically you “check in” at different venues to which you travel — shops, restaurants, bars, airports, train stations, landmarks, bus stops, churches, grocery stores, boutiques, shopping malls, a damn boat. Experience-wise, you get out of it what you put in — ideally you’ll leave tips and notes at places you’ve been, telling the people who arrive after you what to see, do or eat there. For instance, after having a stellar curry in Canterbury, I promptly listed a tip on the place’s Foursquare listing. If you check into a place more times in the past 60 days than anyone else, you become the mayor, a post you hold until someone else boots you. You can see where your friends have been, and earn badges for various things, like checking into specific types of venues, checking into many different venues, or checking in a certain number of times. If you use your imagination, the application is entrepreneurial gold. Several months ago, Gap and American Eagle (I believe) both offered discounts if you checked into their stores. Starbucks offers drink specials for its mayors. The mayor at a Wetherspoon pub in the UK gets 20 percent off his tab. It rewards brand loyalty and in turn, the venue receives your business, and your tips populate the venue’s Foursquare listing. Brands like Zagat, Bravo, The History Channel and the Wall Street Journal have their own special badges that you can earn if you follow them. To earn the Zagat badge, for example, you just need to check in at five different Zagat-rated restaurants. But what about something such as, say, tourism? Cities like New York, Chicago, Boston/Cambridge and San Francisco and even entire states like Pennsylvania have badges designed to give people incentives to explore them, like a scavenger hunt. As I was rooting around online looking for free WiFi hotspots in London (which I’m visiting tomorrow to see friends, woo), it occurred to me just how awesome a London-based collection of badges (both for tourists and people who actually live or work there) could be. Check into 10 different Underground stations and get a Tube badge. Hit 3+ musicals or other shows and get the West End badge. 3+ gallery check-ins? Give ’em a Turner badge (a generic Warhol badge already exists for gallery check-ins). Hit Paddington, King’s Cross/St. Pancras, Waterloo, Victoria and Charing Cross and get a Rail Rider badge. Multiple check-ins in the City gets you a Financial Whiz badge (I know WSJ does something similar for financial district check-ins in New York). Check into 5+ castles or royal residences (not necessarily just in London) and earn a King/Queen for a Day badge. 5+ churches, cathedrals or historical houses of worship, like St. Paul’s or Westminster Abbey, ought to be good for something … pious. London pub crawl badge? Yes, please. Even better, narrow it down by the specific beer associated with each pub. A Borough Hopper badge for visiting 5+ different boroughs, like Chelsea, Westminster, Camden and Southwark. A Sloaner badge for checking into 3+ shops on Sloane Street, or Harrods. The London 2012 badge is so obvious I’m not even going to elaborate. 3+ museums should get you a Rosetta Stone badge. Double-decker badge for 5+ check-ins on a bus. There’s already a badge for checking in on or near a boat, but what about on or near the Thames? Ultimate London badge for checking into 15+ predetermined landmarks (this would be an awesome scavenger hunt/travel itinerary thing). London Nightlife badge for checking into 3+ predetermined bars or night clubs. The Footie badge for checking into 3+ football matches. Earn a Green London badge for visiting 3+ city parks. Check in 5+ times while crossing the Thames and get a Bridge Too Far badge. And this isn’t even counting event-specific badges for things like Fashion Week, the opening of Parliament, Wimbledon, general elections, Trafalgar Square rallies, major sporting events, the queen’s birthday and Guy Fawkes night. I came up with 20 specific badges right off the top of my head. In addition to the badges, tangible rewards are also easy to figure out — check in on the Eye, get a discount on your next ticket. 15% off museum/gallery gift shops if you earn those badges. Discounted train fare, free entry to landmarks, store deals. So why isn’t anyone (the local government, Transport for London, a media group or someone) doing this already? Do you really want the Yanks to have all the fun?